WASHINGTON (Sept. 26, 2018) — The metropolitan Washington, D.C. region currently experiences health inequities related to access to care in underserved areas, disparities in chronic disease outcomes, provider shortages, and inadequate diversity of the health professions. Research has shown that a more diverse health care workforce can help address these problems. With the support of a more than $3.1 million grant from the Health Resources and Services Administration, a multidisciplinary team has developed an educational pipeline program that leverages regional partnerships with public schools, community colleges, and health care employers to create seamless training and workforce development opportunities for students in the region. The team is led by faculty and research staff at the George Washington University (GW) School of Medicine and Health Sciences and supported by educational scholars from the GW Graduate School of Education and Human Development. 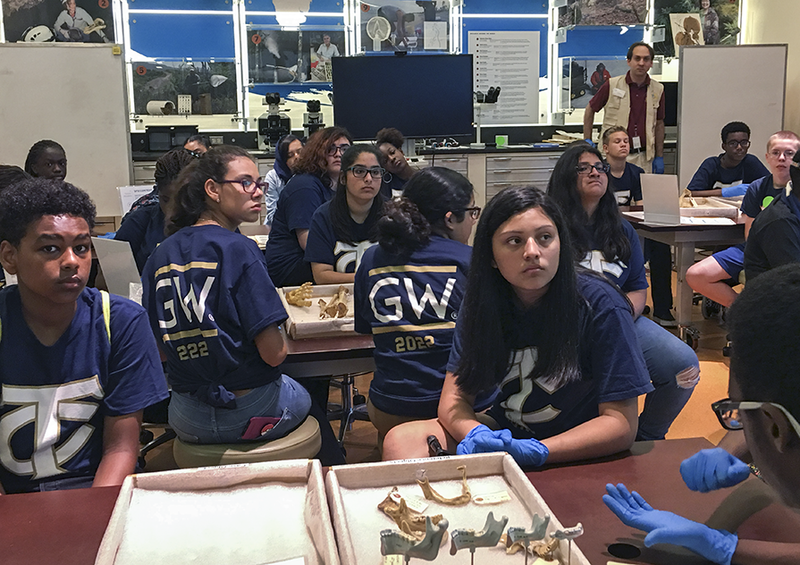 The GW Health Careers Opportunity Program establishes a health sciences-focused high school academy through public-private partnership to address regional health care workforce needs. Students in the academy are exposed to health care topics such as medicine and surgery, emergency health services, medical laboratory sciences, biomedical informatics, rehabilitative sciences, and pharmacy. The program also enhances post-baccalaureate training for students from disadvantaged backgrounds with guaranteed admission pathways into graduate health professions programs. It also expands a flexible, accelerated health care training pathway for military and veteran students seeking a bachelor’s degree. The project assembles a sustainable educational infrastructure and workforce pipeline through a regional, multi-institutional integrated network. Additionally, students gain specialized training in health equity, community engagement, and evidence-based strategies to combat public health challenges, such as obesity, asthma, and opioid-related disorders. GW recently partnered with Alexandria City Public Schools to establish the Governor’s Health Sciences Academy in Virginia. This academy welcomed its first cohort of students in September 2018. Media: To interview Dr. Bushardt, please contact Ashley Rizzardo at amrizz713@gwu.edu or 202-994-8679.